I have never dreaded a challenge as I do this one. 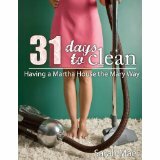 31 days to Clean by Sarah Mae. Sarah, what were you thinking? How did I even come across this one? I’m the challenger…why would I go to this dark place? Now don’t get me wrong. I like things clean. If I were alone, I would have an amazing time with this book. I’d probably hum like Cinderella while cleaning or maybe whistled while I worked. But I don’t live alone. There are many hands in this house and they all know how to anti-clean very well. I am very concerned already that I will quit this challenge. But YOU won’t let that happen, will you? If you are reading this you are hereby bound to help me. You may try not to, but there will be a nagging voice in your head that speaks ever so often, I wonder how that poor Peachie girl is doing in her cleaning challenge? You are one of my only bright spots in this ever so dirty escapade. You will help me conquer the clean. I do feel as though I may need to hold myself to some rules. This may just change my life … or not.